Jesus Christ’s first disciples were “sinners,” like all of us, but they had a great strong point: they never spoke badly of one another and in this they gave a great example, succeeding in spreading the Gospel throughout the world. 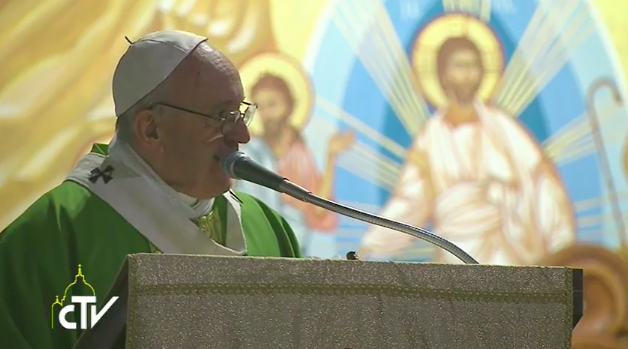 In his first post-Jubilee parish visit to Setteville of Guidonia in Rome, Pope Francis prayed for a special grace for the community: to never “gossip,” to never talk about one another. The Holy Father took his cue from today’s Gospel (John 1:29-34), to reflect on the concept of “testimony”: many of John the Baptist’s disciples listened to the prophet’s testimony, chose to follow Jesus and “remained happy,” saying: “We have found the Messiah!” Those first disciples of the Nazarene “felt Jesus’ presence thanks to a man, John, who gave witness of Christ. Those first disciples, the Apostles, did not follow a course,” nor did they “go to university” to give witness of Jesus Christ. Moreover, they were all “sinners,” not “only Judas” of whom, after all, we do not know what happened after his death,” in as much as, perhaps, God’s mercy could have saved him. Hence, the Pope re-launched a strong point of his preaching: “A community where there are gossipers doesn’t give witness. If you have something to say, say it to the face or, at most, “say it to the parish priest.” From whence the Bishop of Rome drew his recommendation to Saint Mary’s parish: “I would like this community to make the resolution not to gossip.” In face of such a temptation, “bite your tongue!”, he added.